Ralph Rover is a traveler at heart, and has always dreamed of shipping out to the South Seas islands. He finally convinces his aging parents to let him go and find his way in the world. But the islands that Ralph finds are not as idyllic as in his dreams. 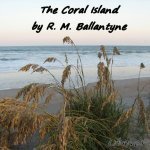 Shipwrecked on a large island, Ralph and his fellow survivors, Jim and Peterkin, discover a world of hostile natives and villainous pirates. Danger, high adventure, and wonders of the sea greet them at every turn. When all seems lost, they find help from an unexpected source.